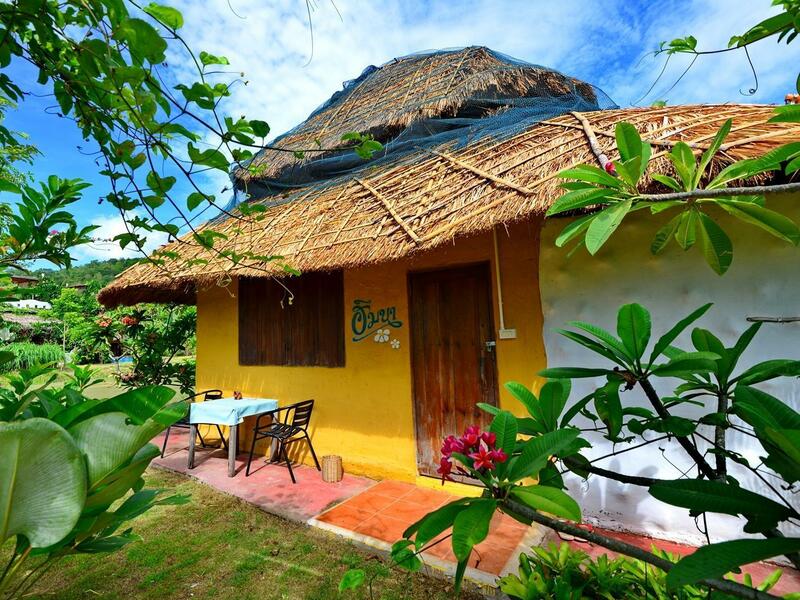 Heeft u een vraag voor Youdin Kindee Farmstay? Ontworpen voor zowel zakelijke reizigers als toeristen, is het Youdin Kindee Farmstay ideaal gelegen in Mae Rim; één van de meest populaire buurten van de stad. Het levendige stadscentrum is slechts 20.6 km verwijderd. Dankzij de praktische locatie liggen alle belangrijke trekpleisters in de buurt van het hotel. Het Youdin Kindee Farmstay biedt tevens vele faciliteiten om uw verblijf in Chiang Mai zo aangenaam mogelijk te maken. Gratis wi-fi in alle kamers, dagelijkse schoonmaak, wi-fi in openbare ruimtes, parkeerplaats, familiekamer zijn slechts enkele van de faciliteiten waarmee het Youdin Kindee Farmstay zich onderscheidt van andere hotels in stad. Aanvullend beschikken alle gastenkamers over een variëteit aan voorzieningen als handdoeken, oploskoffie, plasma tv, sofa, spiegel, om zelfs de meest veeleisende gast te tevreden te stellen. Daarnaast garanderen de talrijke recreatieve mogelijkheden dat u zich tijdens uw verblijf kunt vermaken in het hotel. 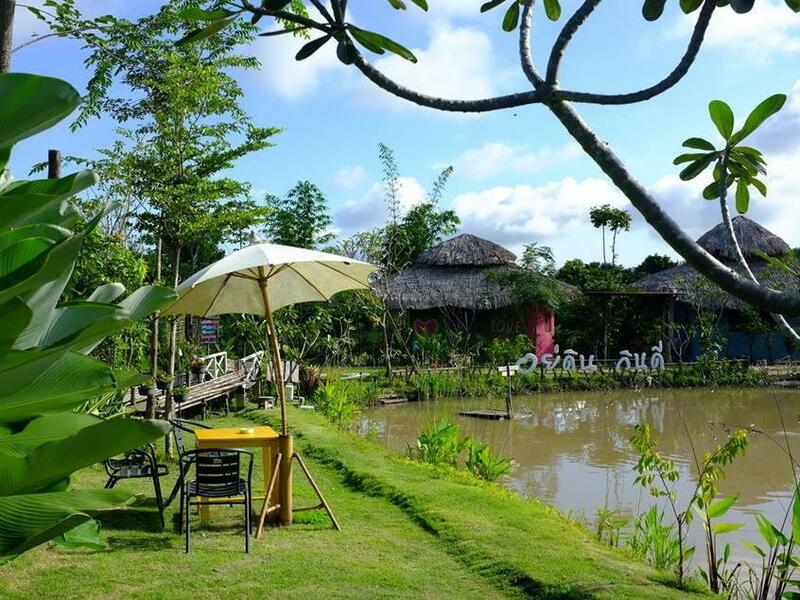 Fantastische faciliteiten en een uitstekende locatie maken het Youdin Kindee Farmstay de perfecte uitvalsbasis om van uw verblijf in Chiang Mai te genieten. Way out away from it all this place is a gem. The facilities are unlike anything else we saw on our whole 5 weeks traveling, or any traveling for that matter. 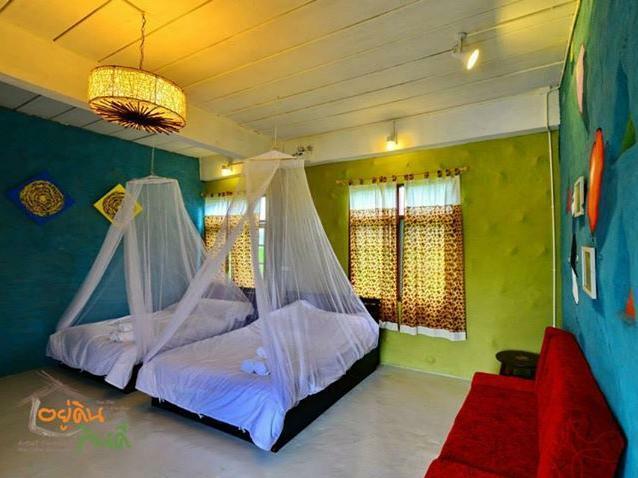 Our bungalow was so cool! Huge open space, and so artistic. The bathroom was huge and there was homemade shampoo, soap and conditioner. The owner made us an INCREDIBLE thai dinner when we arrived and although there was no menu we were very pleased. Breakfast was great and our host was very helpful, kind and interesting. We would've like to stay longer. The only downside is the area is somewhat remote and residential. There’s nothing more perfect than waking up in the mountain air! That I needed to relax and kick it away from the city for a few days. Surrounded by sunny and sloping with a view. We can tell that the hosts are our kind of people. They shares all of information and has everything on hand that you need. We also have organic rices and vegetables every meal. The whole experience was great, I would recommended for anyone looking for a wonderful vacation that you never forget it!! we stayed at moon deck room which can accommodate 4 adults. no air con in the room but it did not really matter as you can feel the cool breeze at the night time. the owner cooked us dinner which really nice and great. they do have 3 dogs which are cute and friendly. we did really enjoyed our stay here, my parents also loved the place with natural surrounded. we will surely be back here again during the winter time. thanks P''Ton and P'Tong for taking good care of us. we did really enjoy our stay here, the owner is very nice and attentive, he can recommend places to go and visit. breakfast is served as a la carte; American breakfast, or boiled rice; and waffles. it is pet-friendly home-stay, where you can also bring our pets in. Very friendly staff, beautiful&quiet environment, Good food made from farm. I have never felt boring in that farmstay.Thank you for wonderful experience that we will never forget. The owners of the resort are very friendly and helpful couple. breakfast was great and the resort served really nice coffee. We had an enjoyable stay at the resort. The Owners are very friendly and helpful and speak good English. breakfast was delicious and coffee was really nice. Love the puppies running around the resort too. we stayed for 2 nights and enjoyed hanging around in the farm especially during early morning. There are 3 rooftop area with great paddy field views, at night they turn into great star view. The hosts are friendly and helpful, they made us great breakfast and dinner. Mea Rim have scenic view from the mountain, it's not far from the farmstay, we took a half day tour in motorbike going along the road up to mountain (mon jam). 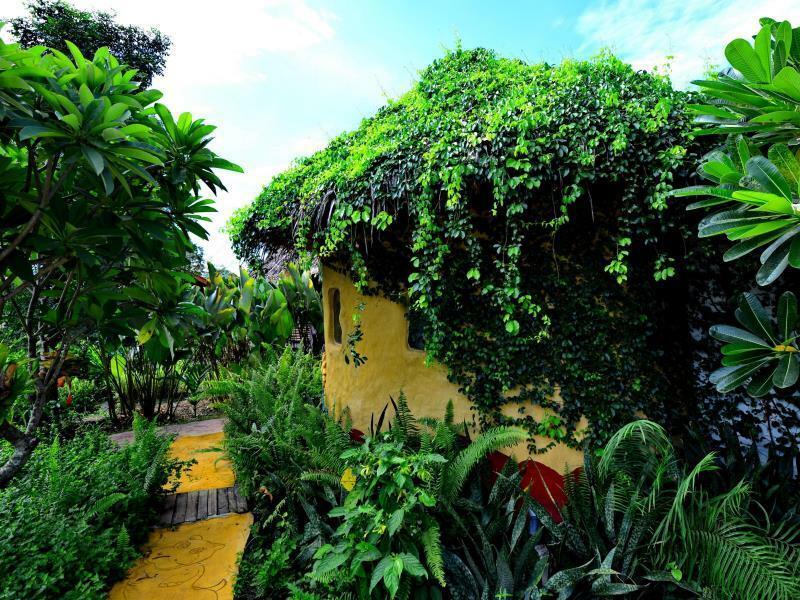 I had a wonderful stay at cottage made from adobe and thatch-roof. Hotel locations in a jungle, quiet and surrounded by mountain and rice fields. I feel living in Asia countryside valley but not far from Chiang Mai and free wifi in all areas of resort. The owners are very friendly and makes you feel at Thai friend home. My wife love doing yoga on the grass when I fishing near by. We had a good time together!! We really enjoyed with herbal steam sauna (free service) and delicious with Thai food in restaurant. Fantastic breakfast with ABF, fresh coffee, fresh herbal tea, home-made dressing salad and very fresh vegetables and fruits are products from this farm. We were very happy with holidays and this was the perfect getaway. nice views, clean air. We would love to come back!. because we left our heart in YOUDIN KINDEE FARMSTAY. Great food, very warm welcome and peace. Good for relax, full filled energy and peaceful. This place good for couple, family and friends. friendly environment, good for family with pets. Even facilities were not luxury but enough for slow life in easy going day. It is tricky to locate the farm without gps with the tight angle turns. The location is far from city, but close to attractions. They provide breakfast and dinner. Which is excellent. The owner is a photographer and traveller, pictures decorated in the farm were taken during his adventures. Bring mosquito coil for the night. Ask the owners for attraction recommendations. A very satisfied stay at the farm. Hotel is very peaceful and fresh air , nice room , good service and welcoming from owner. But suitable for traveler who has car or motorcycle as hotel quite far from main road but you can call hotel to pick you up. Cuatro días geniales en Youdin Kindee. Información práctica: el hotel es precioso, cuidado hasta el último detalle. Habitaciones muy bonitas, nuevas, con personalidad, inmaculadamente limpias y espaciosas (también el baño). Los espacios comunes (terrazas, restaurante, etc.) tienen muchísimo encanto, ¡sacamos fotos de todos los rincones!. El desayuno súper abundante, ningún día pude terminarlo. El plus: Tong, su esposa y el equipo son súper amables y atentos, tuvieron muchos detalles. Sin decirles nada nos dieron una habitación superior sin recargo porque era época de siembra y creían que en esa íbamos a estar más tranquilos (como así fue). Contratamos a un precio muy razonable dos excursiones y fue el mismo Tong el que nos hizo de guía, escuchó nuestras preferencias y adaptó el itinerario para que lo disfrutáramos (Mon Cham y Doi Inthanon, impresionantes e inolvidables paisajes) y nos hicieron un desayuno de despedida espectacular. Lo recomiendo sin ninguna duda. Gracias por cuidarnos tan bien.